William "Red" Holzman (August 10, 1920 – November 13, 1998) was an American professional basketball player and coach. He is probably best known as the head coach of the New York Knicks of the National Basketball Association (NBA) from 1967 to 1982. Holzman helped lead the Knicks to two NBA Championships in 1970 and 1973, and was inducted into the Basketball Hall of Fame in 1986. In 1996, Holzman was named one of the Top 10 Coaches in NBA History. Born in Brooklyn, New York in 1920, to Jewish immigrant parents, as the son of a Romanian mother and Russian father. Holzman grew up in that borough's Ocean Hill–Brownsville neighborhood and played basketball for Franklin K. Lane High School in the mid-1930s. He attended the University of Baltimore and later the City College of New York, where he played for two years until graduation in 1942. Holzman joined the United States Navy in the same year, and played on the Norfolk, Virginia Naval Base team for two years. 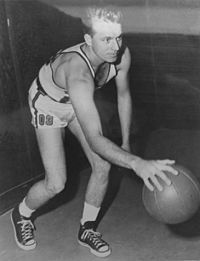 Holzman was discharged from the Navy in 1945 and subsequently joined the NBL Rochester Royals, which won the NBL championship in Holzman's first season. Holzman was Rookie of the Year in 1944–45. In 1945–46 and 1947–48 he was on the NBL's first All League team; in the interim year he was on its second team. Holzman stayed with the team through their move to the NBA and subsequent NBA championship in 1951. In 1953, Holzman left the Royals and joined the Milwaukee Hawks as a player-coach, eventually retiring as a player in 1954 but continuing as the team's head coach. During the 1956–1957 season, Holzman led the Hawks (then in St. Louis, Missouri) to 19 losses during their first 33 games, and was subsequently fired. In 1957, Holzman became a scout for the New York Knicks for ten years ending in 1967, whereupon he became the team's head coach for the most part until 1982. (Holzman's former player, Willis Reed, replaced him as Knicks head coach in 1977, but Holzman returned near the start of the 1978–1979 season.) During this 15-year span as Knicks' coach, Holzman won a total of 613 games, including two NBA championships in 1970 and 1973. In 1969, Holzman coached the Knicks to a then single-season NBA record 18-game win streak, breaking the 17-game record first set back in 1946. For his efforts leading up to the Knicks' 1970 championship win, Holzman was named the NBA Coach of the Year for that year. He was one of very few individuals to have won an NBA championship as both player and coach. As a coach, his final record was 696 wins and 604 losses. In 1985, he was elected into the Naismith Memorial Basketball Hall of Fame. The New York Knicks have retired the number 613 in his honor, equaling the number of wins he accumulated as their head coach. He is also a member of the International Jewish Sports Hall of Fame. He lived with his wife in a home they bought in Cedarhurst, New York in the 1950s. Following his lengthy NBA coaching career, Holzman was diagnosed with leukemia and died at Long Island Jewish Medical Center in New Hyde Park, New York in 1998. ^ "Top 10 Coaches in NBA History". NBA.com. Retrieved March 14, 2008. ^ Othello Harris, George Kirsch; Claire Nolte (April 2000). Encyclopedia of Ethnicity and Sports in the United States. Westport, Connecticut: Greenwood Publishing Group. p. 222. ISBN 0-313-29911-0. ^ Dimitry, Steve (1998). "Extinct Sports Leagues: National Basketball League (1937-1949)". Archived from the original on August 18, 2005. ^ a b Berkow, Ira (November 15, 1998). "Red Holzman, Hall of Fame Coach, Dies at 78". The New York Times. Retrieved September 15, 2008. Holzman, Red (1987). Red on Red: The Autobiography of Red Holzman. Bantam Books. ISBN 978-0-553-27316-8. Holzman, Red (1980). A View from the Bench. W. W. Norton & Company. ISBN 978-0-393-33623-8. This page was last edited on 5 January 2019, at 15:24 (UTC).